Modern quilts have a very distinct look about them: bright colors, unexpected geometric lines, and most have solid backgrounds. In fact, the landscape in Utah this winter has had me thinking daily about making my own modern quilt: colorful roof tops on an all-white background. 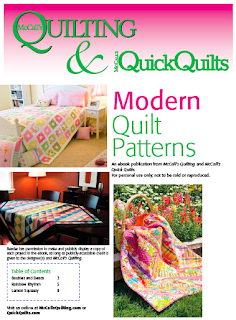 If you would like to try your hand at modern quilts, McCall's has put out a downloadable eBook with three patterns which could get you started on this trend. The patterns (shown above) will give you an opportunity to choose which type of modern quilt appeals most to you. Of particular interest to me were the first (roof tops and snow!) and third patterns. You may have noticed I haven't made many scrappy quilts, and my version of the third quilt will probably have more harmonious tones to it. However, I love the diagonal strip placement, as well as the quilt-as-you-go construction. All three patterns are major stash busters for all of us... 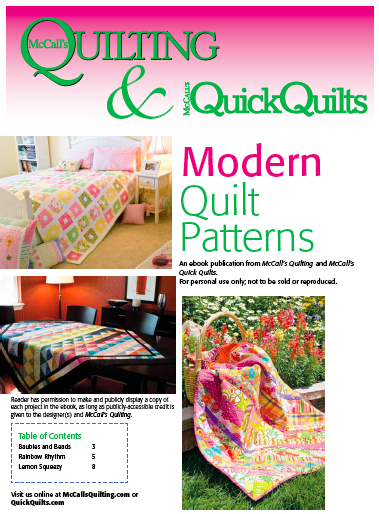 This free downloadable eBook can be accessed by going to http://www.mccallsquilting.com/free-modern-quilt-patterns. As before (you recently downloaded the Log Cabin eBook, which they actually updated to correct minor errors: download it again by going to http://www.fonsandporter.com/landing/free-log-cabin-quilt-patterns), they will require your email address before you download it. Muito obrigada,adorei.A primeira eu vou fazer(é fácil)as outras vou guardar para u dia....Beijos e Bençãos.